The trip began with a rather cool morning, accented by a persistent drizzle. Thankfully, what our morning lacked in literal sunshine, our bright and cheery tour guide more than made up for with his sunny disposition. As our packed tourist van set off, he turned around in the front seat and introduced himself with a wide smile, a smile that would rarely leave his face as the trip went on. With the help of a clipboard full of photographs and drawings he would flip through and point at to illustrate his words, he went on to point out several local landmarks and to describe the first leg of our journey: a night spent on a boat on Ha Long Bay! About halfway through the ride we stop at one of the seemingly obligatory “tourist trap” rest stops. They are all identical. In fact, I remarked to Lanza as we pulled in that we had stopped here the day before, but he corrected me that this was apparently a completely unique establishment. This is not to diminish from the fact that the statues and colorful embroidery portraits they try to sell alongside postcards and snacks are not beautiful or well-made. They are. But prices are high and the work is made from patterns. One does not get the feeling that the higher price necessarily leads to a higher wage for the artists. As we wait, Lanza also points out that I am wearing the same color and style of elephant-patterned pants as two other girls on the van. We ask and, of course, they also bought their pants in Vietnam. Not hard to play Spot The Tourist here! After several more hours in the van, we all pile out once again, and find ourselves in noticeably warmer weather, which I welcome happily. After two days of a freak cold snap in Hanoi, I was starting to think Vietnam was cursing me with the cold as punishment for complaining about the heat so much. 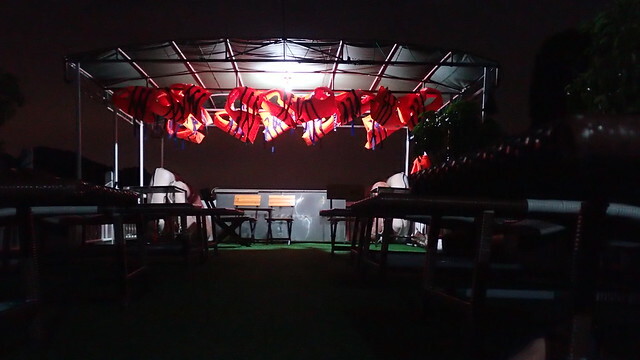 We boarded a small boat which contained only benches and a large pile of fluorescent life vests and take a ride to our ship so short it hardly warranted handing out the vests. 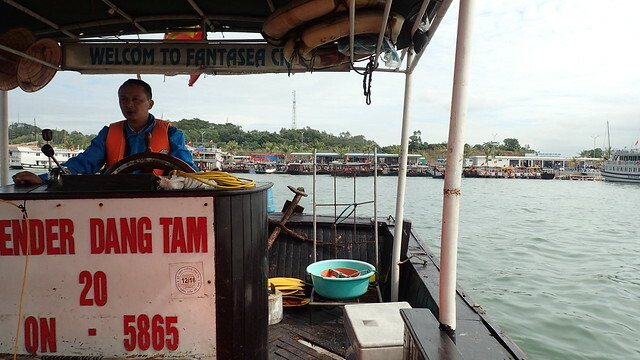 The ship is called Dang Tam, and while it is not exactly the crown jewel in Her Majesty’s Royal Fleet, the charming little vessel boasts a large dining hall, a lounge area up top, and seven modest bedrooms. Before we departed, we had the first of the many family style meals we would enjoy on our two day tour. At this lunch we discovered that besides ourselves, one couple from Canada and a couple from India on their honeymoon, the boat was entirely booked by Danish tourists. Surrounded by so many speakers of their native tongue, our new travel companions would often begin to speak amongst themselves in Danish, and then someone would smile apologetically and explain what they were talking about. Often, though, I really don’t mind being left out of the conversations and listening to the lyrical sounds of an unfamiliar language, happily bumbling around the unexpected twists and turns of a foreign tongue. There is something inexplicably delightful about watching a whole group of faces light up at the punchline of a joke that you had no idea was being told. After lunch we finally set off to cruise through the bay. 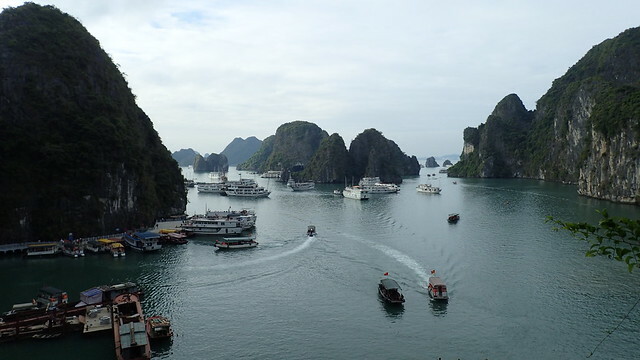 Ha Long Bay is one of the Seven Natural Wonders of the World, and it is easy to see why. 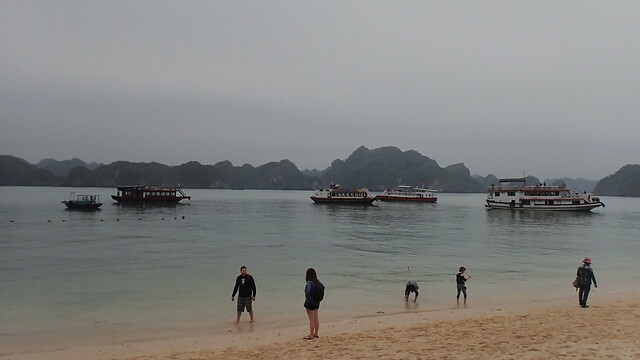 While the water is dotted with many other tourist boats and fishing vessels, it never feels crowded. 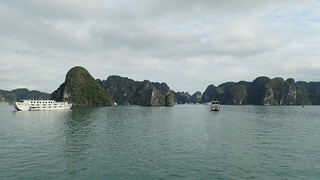 Innumerable limestone karsts rise steeply from the calm surface of the water. Each gray structure is coated in a dense layer of forest wherever the sheer rock face gave way to gentle rounded curves of hilltop. The foliage that covers and crowns these micro islands is so lushly and uniformly green, it is as if it was colored in with the “leaf green” shade of colored pencil. Most of the structures tower stories above us and our boat, which makes the fact that many of them have large caves beneath their surfaces that much cooler. Our first stop is within one of these tunnel systems, although we had to wait in a long line snaking up a steep and narrow stairway to the mouth of the cave. 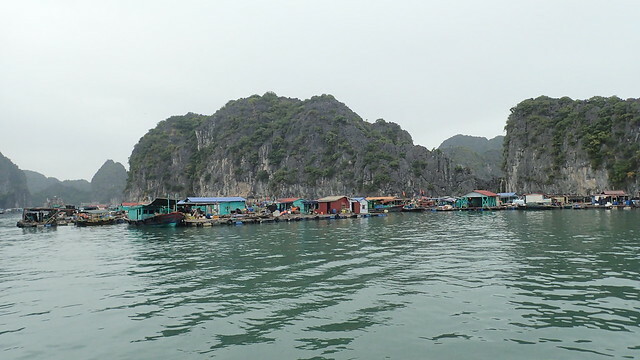 A couple dozen of the tourist sleeper boats had also made their way to this spot, and half the time it was difficult to hear our own guide over the sound of another guide who had a microphone to really help with the whole echo phenomenon. The cave is much larger than expected, and decorated with multicolored lights. 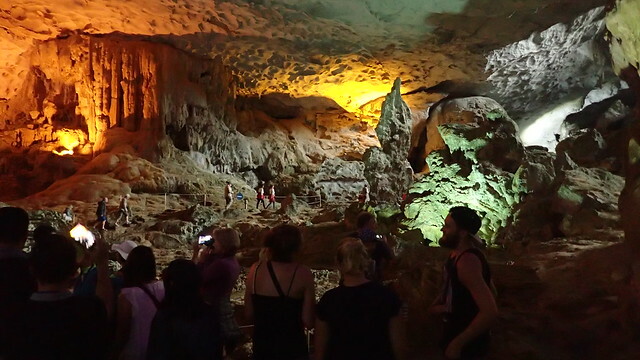 Our guide brought us through several stops to point out various stalactite or stalagmite structures and to tell a little folklore story about each. The amount of imagination it took to see the supposed images in the rocks ranged from moderate to magic mushroom, and some of the formations were clearly staged, but many of the stories had touching messages of true love and kindness towards others. Afterwards we immediately began to prepare to go kayaking and watch the rapidly approaching sunset. Although I had initially protested that I did not want to do anything that required upper body strength on my vacation, I was happy I gave in to peer pressure because it was one of my favorite parts of the whole trip. After a late start, we sped as quickly as we could towards two large karsts directly west; as soon as we rounded a corner and went between them, the sky exploded into cotton candy, sumptuous clouds of pink that swirled to blue in their own watery reflections. This vivid backdrop framed the rolling green hills, which had started to fade to purple in the changing light. 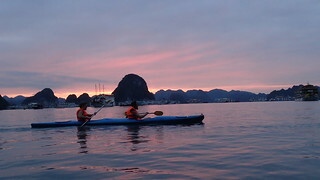 It was a mesmerizing scene, but we had little time to waste if we wanted to keep up with our guide through a large loop of the area before dark. One thing is for sure, if you got lost out here after dark, you would be screwed. Once night begins to fall there is no way to distinguish one boat from another, and the carstes begin to vanish one by one. It is only thanks to a group effort and a little luck that we found our way back to the dock we had embarked from. After a quick shower, we spent a pleasant evening with our shipmates, starting with a happy hour which halved prices on alcohol. As with any cruise ship, the price of the alcohol and snacks they sell on board are much higher than you would pay back on the mainland, but I assure myself that our days of frugality balance out these days of indulgence. Our dinner was a bountiful spread of shrimp and clams, chicken and beef and pork, veggies and fruits – and, of course, rice! For dessert, we all got a special treat when the Honeymoon Couple was presented with a sparkler-topped cake in the shape of a heart, which I somehow found room for after second and third helpings of dinner. Our meal was followed by several hours of conversation, where the Danes managed to surprise even Lanza with their descriptions of a rather liberal cultural attitude towards teen dating. 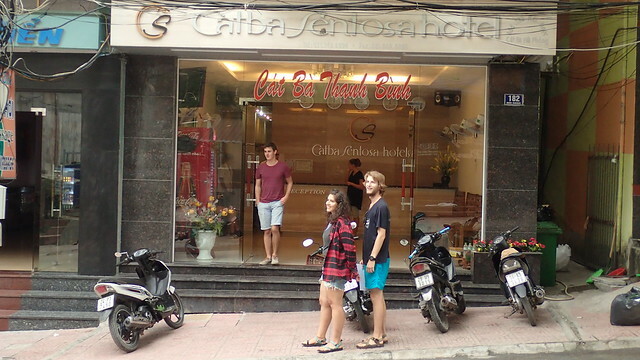 Our second day of the tour has hiking on Cat Ba Island up first on the agenda. 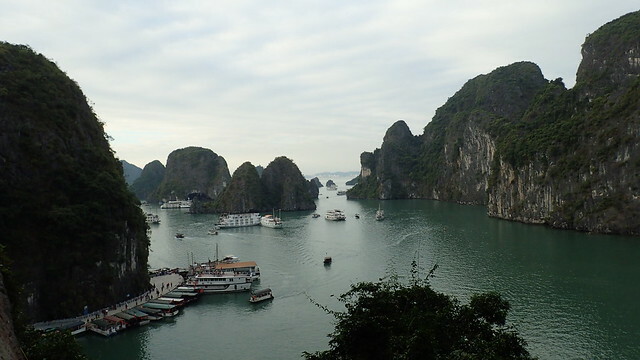 While some of the limestone formations are simply big rocks with a few trees, some are large enough to be bona fide islands, with roads and homes and hotels. 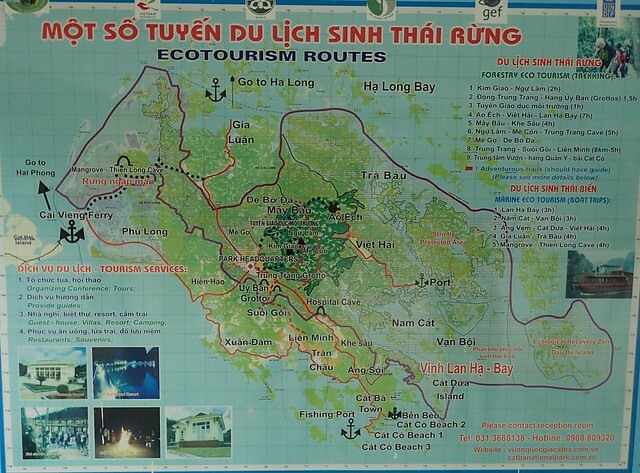 Cat Ba Island is the largest island in the bay, and about half of it is covered in the National Park that we are about to explore. We start off as a group, but eventually the trail forks and we can choose to follow our tour guide down the easy path or venture off on our own down the hard path. 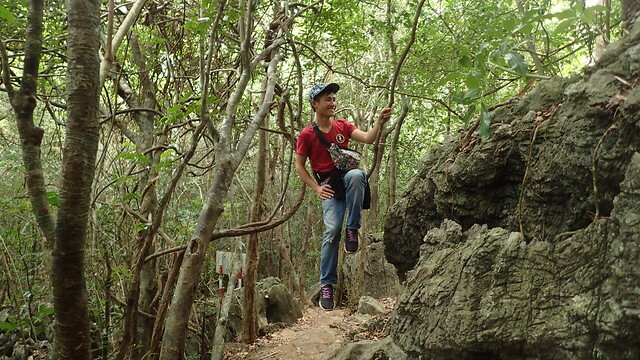 Obviously, as we are fearless adventure travelers, we took the hard path. 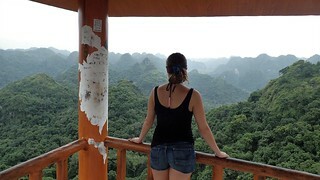 Once we climbed 531 feet up the mountainside, we came upon a look out tower. When we looked back, we were surprised to see a small sign warning “Do Not Enter” at the mouth of the trail we had most certainly just entered from. Either it was a one way trail or our guide just wanted to see if we could really do it! The view from the lookout tower is fantastic. It looks like an entire mountain range has been shrunk down to fit on this little island, the lush valleys rising up to sharp peaks that touch the misty skies before swooping back down again. In the distance, a tiny village nestled among the hills is the only interruption to the endless green. But the moment was here! We had been warned by our tour guide to not bring any food because the monkeys would stop at no lengths to steal it. I eyed multiple passengers with bags of bread and fruit suspiciously and made a mental note not to stand anywhere near them once we arrived. As the boat pulled up alongside a long wooden dock, I watched in muted horror as monkeys began galloping across the sand, at first just one or two, but then a wave of them came rushing towards us as word travelled that the next buffett had arrived. I chose to wade knee deep in the warm clear water and wondered idly if monkeys could swim. However, I did not need to worry about them zeroing in on me because so many other people were just handing them food and beverages. They were extremely cute and rather polite as they took snacks right out of peoples hands, but I was still more than happy to observe from a safe distance. I watched as a woman with a thick British accent taunted a baby monkey with an empty beer can so she could take a funny picture of him looking like a little alcoholic. How precious. Unfortunately, the animal did not take to being teased very well and lunged for the woman’s ankle, drawing blood and leaving teeth imprints, which bruised dark purple immediately. 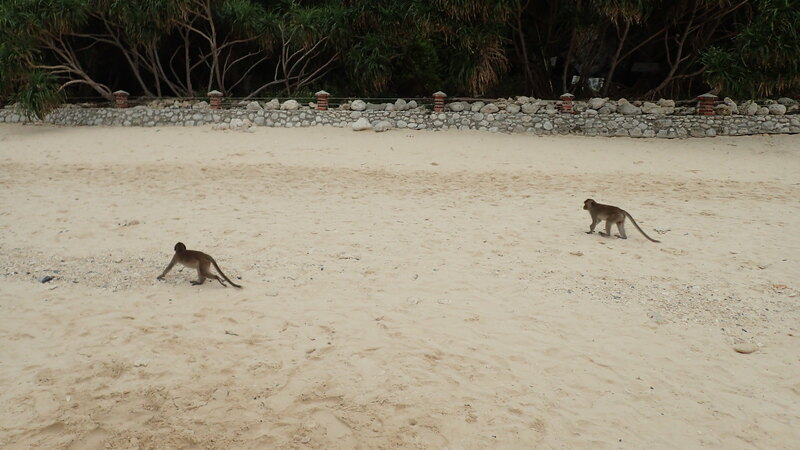 The moral of the story is, I may have been a big scaredy cat, but at least I did not have to find time in my trip to seek out a doctor for monkey bites! Share the post "The hiking path less traveled"